For those without comedic tastes, the so-called experts at Wikipedia have an article about Hand grenade. This article is part of the List of weapons that don't exist, but should. ~ Oscar Wilde on Hand Grenade. 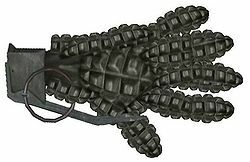 The M822 Hand Grenade is an explosive device that resembles a hand. On activation, the device lunges towards the nearest face or face-like object, slapping it and immediately exploding violently in a gruesome mess. Special care must be taken when activating the grenade. When activated, one should run behind the nearest wall or bush and squat down, so that the grenade cannot "see" you. This will prevent the grenade from jumping at you, and will ensure no harm is done to you. Making any hand signs including the "Peace Sign", the "Shocker", or "Flipping the Bird"
An early model of the hand grenade was see in the movie Death Race 2000. It was used to slap an old lady, who then cried about it. There were no explosions. It is rumoured that some of the first hand grenade prototypes were used during the Spartacist uprising of Germany in January 1919. Due to a lack of records that exist in what we have come to perceive as reality, historians cannot be sure as to whom the grenades belonged. Whilst some individuals have suggested that death certificates may be examined to determine the longest survivor of the uprising as the most probable owner of the hand grenades, the suggestions have never been referred to until now, rendering them less than helpful. An eye-witness who cannot be named for lack of effort told the CBBC in 1999 of how several hand grenades thrown at once began to wrestle with each other. This 'wrestling' effect produced by the hand grenades allegedly caused much confusion, which resulted in everyone within a kilometre radius of the hand grenades becoming retarded. This hand grenade 'wrestling' phenomena was known to be used as a tactic by a small boy who once imagined a war in his head. Because of the highly retarding effects of the grenade and the lack of significant space between the war and the boy's brain, the boy soon decided to move onto a different game. 1. Put some extra virgin acid in to the pan, then place the grenade in the pan. 2. Use low heat to fry gently for 5 minutes for rare or 10 for well done. 3. Add a sprinkle of TNT and a few bullets for garnish. 4. Serve with a plate, fork, knife, and a bomb suit. This page was last edited on 9 March 2012, at 15:54.